The Liverpool manager has also been warned about his future conduct after the incident. Jurgen Klopp entered the pitch to celebrate Liverpool's late winner with goalkeeper Alisson. 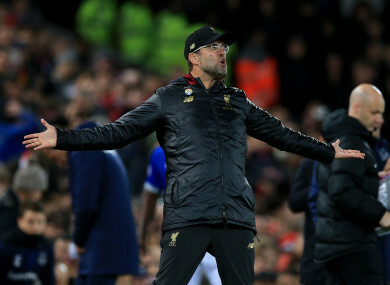 LIVERPOOL MANAGER JURGEN Klopp has accepted an FA misconduct charge and been fined £8,000 for running onto the pitch in celebration of Divock Origi’s 96th-minute Merseyside derby winner. Klopp has also been warned about his future conduct after the incident, for which he apologised to Everton manager Marco Silva. The German manager admitted his actions were “not cool”, but Everton boss Silva admitted he wasn’t especially perturbed by Klopp’s celebrations. After Origi’s dramatic late winner, Klopp sprinted onto the pitch and embraced Liverpool goalkeeper Alisson Becker before returning to the touchline. “I didn’t want to be disrespectful but I couldn’t stop myself,” he later added. Email “Klopp fined after accepting misconduct charge for derby pitch invasion”. Feedback on “Klopp fined after accepting misconduct charge for derby pitch invasion”.